Condition is Used. Missiles there. Instructions good 2. Missing back panel?. 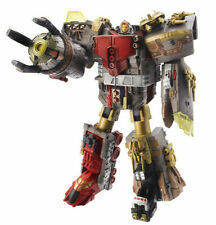 This is a Transformers Energon Supreme Class Omega Supreme figure. Figure is complete with Headmaster figure, both missiles, and all parts. Electronics have been tested and work. Figure is in great condition. This is a wonderful addition to your Transformers collection! All of the major websites and identification books break down the toys this way and so do I. Weapons/Accessories:100% complete you will receive the original instructions. Joints:Very good joints and poses well! Half of Omega Supreme from Energon. Use him for customs or to complete your own. Buy with confidence. I'm a 100% positive feedback adult collector and my home is smoke-and pet-free. Everyone has a different idea of what "MINT" is so I will rarely ever say an item is in "MINT" condition. The box is opened but still has the cardboard insert, comic and his card. He is only missing the firing missiles. So I'm sure you'll be happy. I use only strong, clean boxes. Transformers Energon Omega Supreme Head right arm. Condition is Used. Shipped with USPS Priority Mail. 100% complete with all parts/accessories. 100% authentic Hasbro/Takara products. Sold as pictured. Doing that is against U.S. and international laws. This item is used. Excellent condition. Genuine Hasbro U.S. release. Tons more g1 instructions will be listed. Trending at $17.66eBay determines this price through a machine learned model of the product's sale prices within the last 90 days. These Are The Original Video Rental Cards That Sat Behind The DVD Case In A Local Blockbuster That Closed Down. These Are Only The Rental Cards And No DVD Is Included. Transformers Energon Omega Supreme Figure Leader Class Incomplete Rare Powerlinx As pictured. Incomplete. Shows wear. Item is pre-owned, used, and has light play wear. Overall in good condition. See photo(s)! Sold AS IS. 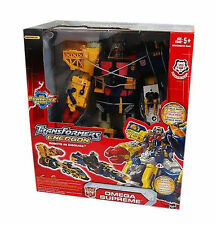 New ListingTransformers energon omega supreme.